The first time I saw the All Blacks play in person was that classic 53-37 victory against Wales during the 2003 Rugby World Cup in Sydney. New Zealand wouldn’t win the Cup that year (finishing third), but there was no doubt they were still an international rugby power with rabid fans throughout the world. On a wet June night nearly five years later, I’m sitting in Auckland’s legendary Eden Park watching the vaunted All Blacks effectively dispatch 2007 RWC runner-up England by halftime. 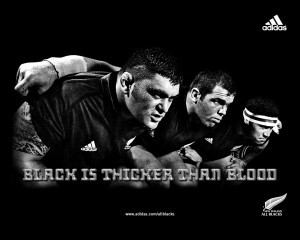 But the attitude of the All Blacks’ fans this night is making one thing clear: Despite the team’s early success in 2008, these are still rather dark days for the darkest uniform in international rugby. What is as true now as always is that Kiwis take their rugby seriously. It’s hard for an American to fully wrap one’s head around what a big deal the All Blacks are here in the land of the long white cloud. They’re the national team in the national sport, and there’s no team in the US that truly matches that appeal. Perhaps if the 1992 Olympic basketball Dream Team—the one with Michael and Magic and Bird and every other hoops legend of the time—had played regularly against the world’s best teams, that might have come close. All Blacks jackets, caps, beanies, scarves, vests and jerseys are so common on the streets of Auckland and Wellington in the winter they might as well be standard issue. (To some degree they are, as the team now gives a jersey to every child born on a match day, with players showing up at the hospital to present it). Like Ian Fleming’s spies, All Blacks are given a number upon their first selection to mark their place in the team’s storied litany. A current marketing campaign for team uniforms centers around the idea that “this is not a jersey” but is an embodiment of the hopes and dreams of more than four million people—and the prevailing wisdom is not that it’s hokey, but far too obvious. Fans not only root for championships from this squad but see titles as birthrights and treat anything short of a first-place finish as blight upon the land. Need proof? When the men in black dropped the 2003 World Cup semifinal against Australia, the national economy took a bit of a nosedive for a week. Things were even worse when, on an October weekend in Wales last year, the heavily favored All Blacks fell short in the closing minutes of a 20-18 loss to France in Cardiff, in the process failing to make the Cup semifinals for the first time ever. The thing is, New Zealand dominates nearly every international rugby competition. Well, every one except the quadrennial World Cup, which a Kiwi squad hasn’t hoisted since 1987 and which this nation treats like a Grail quest. In conversation here, the word “Cardiff” no longer refers to a Welsh city but is shorthand for a national catastrophe like Pearl Harbor or Gallipoli or Munich. The ’07 Cup match made black a color of mourning rather than intimidation, sparking a national sporting malaise and a feeling that the team has to earn back its long-held support. In April, with fanfare worthy of the Warren Commission, the New Zealand Rugby Union released a 47-page investigative report examining how the team could possibly lose to France. The top story on the news that night was a discussion of why the team failed to go for a drop goal six months earlier, and parts of the report were initially redacted when shown on screen. The findings weren’t surprising (that the team should have kicked rather than push for a try late, that conditioning could be better), but they were treated like sensitive national-security secrets. There are people who don’t take a heart attack quite this seriously; which is probably good, as they’d inevitably have another on the spot. Events since the ’07 Cup have only added more stress to the situation, with call-in shows and man-on-the-street interviews on the TV news regularly making the All Blacks sound like a team without a country. No doubt this was always overstated, but inklings of that feeling still showed against England on this evening in June. Working in New Zealand at the time, I certainly wasn’t going to miss a chance to watch the team that first introduced me to the joy of rugby play live. But this experience would be a bit different than what I witnessed at the ’03 RWC. Time was, the first international test of the year at Eden Park would’ve sold out quickly and featured an overwhelming contingent of die-hard fans draped in black. Not this time. Tickets were still available the week of the match, and the fan apathy was palpable. England fans attempted to organize a “white out” of the stands by wearing their team’s uniform in hostile territory. While that effort came up short, there was an awful lot of white in the stands, even without counting those jerseys obscured by the need for winter coats or slickers given the darkness and storminess of the night. While their efforts were easily topped once the opening notes of the New Zealand anthem played pre-game, the English supporters proved by singing along to “God Save the Queen” that they had a significant presence in the crowd. An All Blacks test is also an “event” that ensures a considerable number of tourists, curious townies and non-rugby fans in the seats. I sat near two Chilean girls who couldn’t have been in the stands for more than a quarter of the match, and spent most of that time taking pictures of each other with the field as a backdrop. A couple a few rows in front (American or Canadian based on their accents) struggled to start a number of North American cheers unfamiliar here. They tried a, “Let’s go All Blacks, let’s go,” only to be met with silence, which prompted them to swear loudly at children who didn’t join in. (They also twice yelled “touchdown” after a try). In the ultimate sign that fans have jumped well over the shark, “the wave” made its appearance early and circled the stadium a few times. Never ones to shrink from pointless mayhem, a few dozen England fans decided it would be cute to routinely throw bottles into the air, showering spectators with beer and plastic projectiles. During the match, of course, some other spectators had to keep one eye on an impressive try by Dan Carter while hunched down and getting soaked with beer. An enormous Kiwi maintenance worker still in uniform got one fan to stop chucking bottles, by tapping him on the head and yelling, “Grow the f— up, d—head or I’ll smack you in the head meself.” The offender instead just kept drinking, later using his empty bottles as urinals rather than fight his way through the crowd. On the field, the All Blacks opened with a rash of early penalties—prompting groans and some boos from weary fans still smarting over a sloppy and narrow season-opening win against Ireland the week before in Wellington. The Kiwis trailed 6-3 early, but for a 20-minute stretch late in the first half they looked like the All Blacks of yore, scoring 20 unanswered points and seeming to win the fans back. Two tries off turnovers scored by England’s Topsy Ojo in his first international test gave Kiwis more chances to remain suspicious, but the All Blacks managed to get a nice ovation once the clock ran out on their 37-20 win. Their play wasn’t the precision style they exhibit at their peak, but was solid enough for a team still smarting from losing a half dozen of its top players to bigger contracts from European squads. Each time a Kiwi drove toward the try line, the fans responded like the die-hards they still remain deep down. Opening the season 2-0 wasn’t going to solve all the All Blacks’ issues, but it was a start. In the weeks since, the team stumbled against rivals South Africa and Australia, but played better as the season went on and began to silence much of the fan complaint. Ultimately, New Zealand fans will forgive, and the stragglers will get behind their team, just as they always have. At least until the next World Cup. Jeff Fleischer is a Chicago-based journalist who has written for Mother Jones, the Sydney Morning Herald, the New Republic, Mental Floss and Chicago Magazine, and is currently an Alicia Patterson Foundation fellow in Oceania.